Do you know about the History of the Matrioshkas? If you have liked this post, ¡Pin on Pinterest! 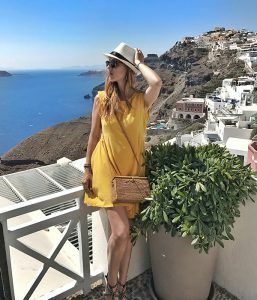 One of the places you can not miss is Izmailovo. It is one of the most beautiful Kremlins in Moscow. In case you don´t know, “Kremlin” means “city walled” therefore, a city can have several Kremlins. In particular, the Izmailovo one is like traveling back in time and get fully into a fairy tale. 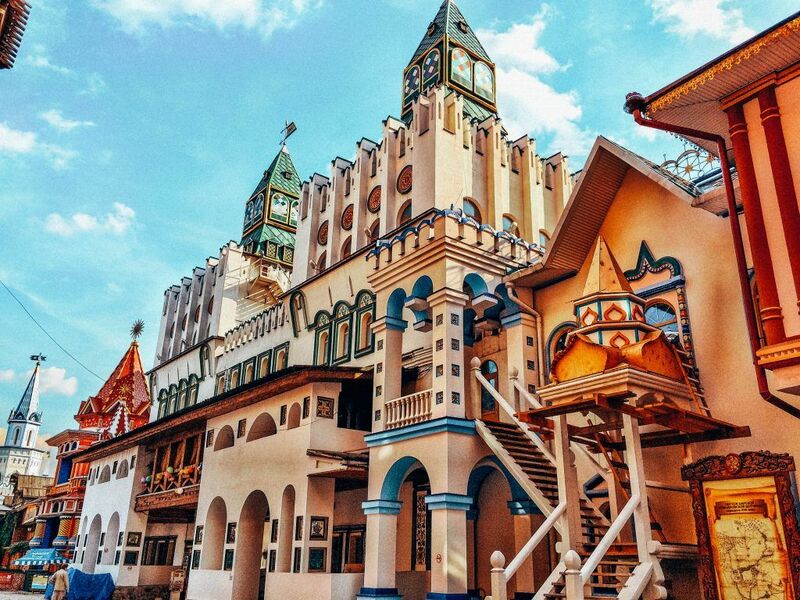 Everything looks like a toy, with its colorful walls perfectly painted and preserved, with its towers and buildings with curious shapes where it seems that a princess really lives waiting to be rescued. Everything is made of wood, a true masterpiece. Russian bread has an almost sacred meaning. It has been the custom among the Slavs: the people who broke the bread and shared it became a lifelong friend. Bread was a kind of ambassador for peace and friendship between peoples, and it continues to be so today. For a good reason, the most appreciated guests are still welcomed with traditional bread and salt. 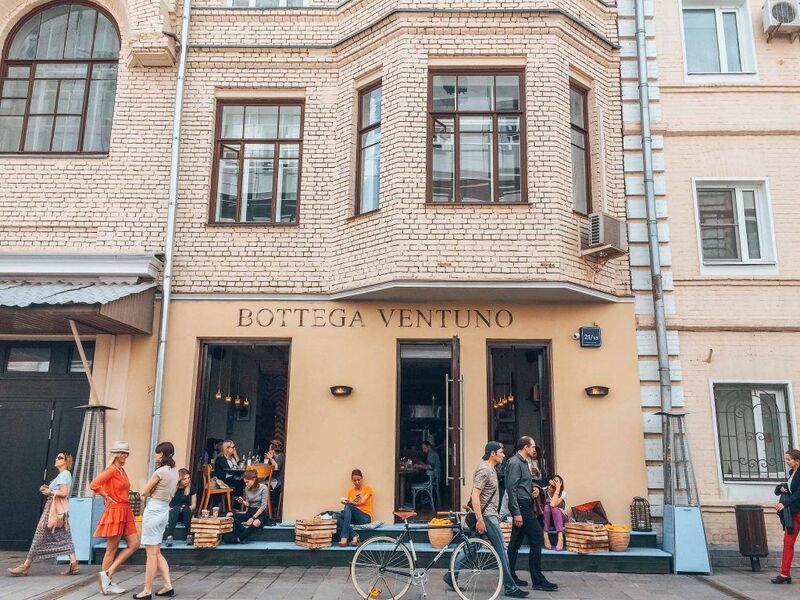 In this museum you can even bake your own bread or decorate cakes, knead bagels or the famous Russian “blinis” and in the store you can, of course, buy bread and cakes as well as drink traditional teas directly from the Samovar. The samovar is a metal container in the shape of a tall coffee machine with an internal fireplace and serves to make tea. Over the centuries, the samovar has become an icon of the Russian tea culture. It is one of the most interesting viewpoints in the Izmailovo Kremlin. It has a collection of bells from the 17th to the 20th centuries. You can even take classes to play the bells well and you can even create a personalized touch. It is tradition in Russia to ring the bell on your wedding day since it means good luck. The panoramic views from here are impressive. It is about the achievements of Peter I in the creation of the Russian navy, about the course of the First Kamchatka Expedition, the history of the War of Crimea and the World Wars. The museum is interactive, here you can even learn how to make knots. 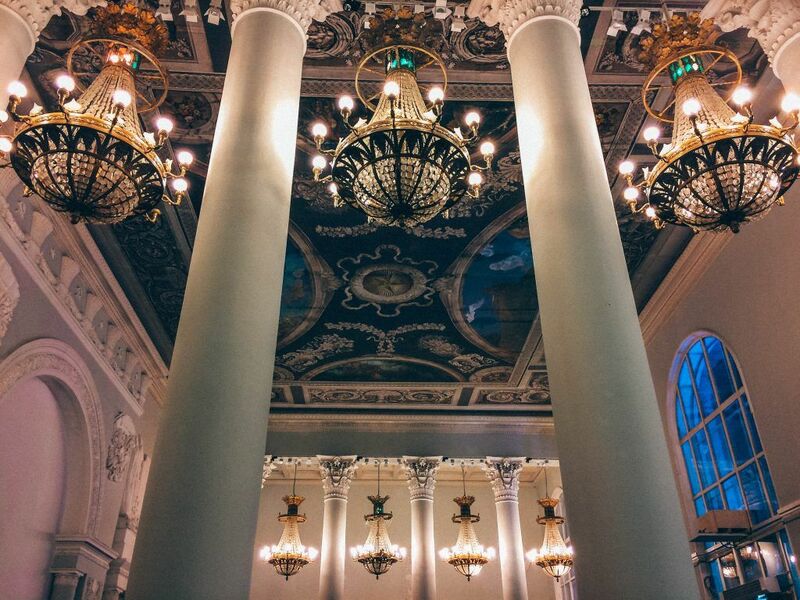 You can book a guided tour here. 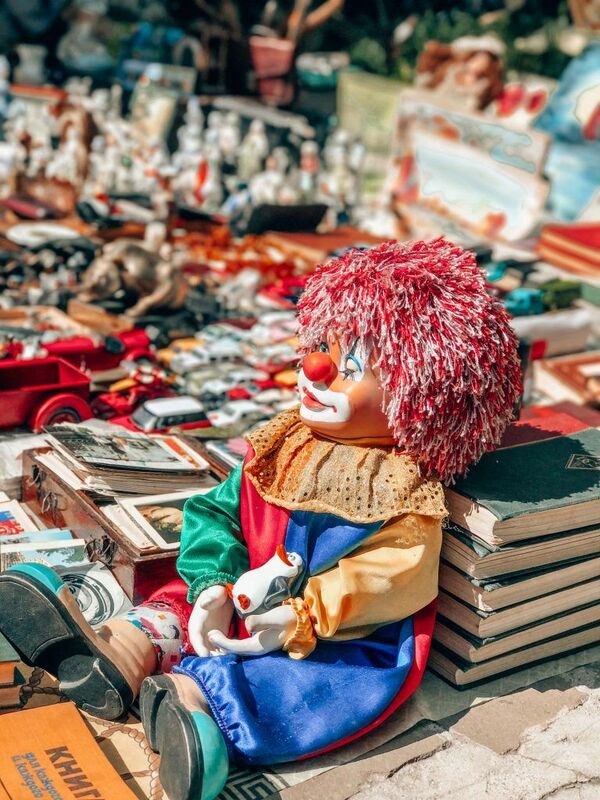 Here you can see hundreds of handmade dolls, created by the best Russian and foreign artists: porcelain dolls, puppets, wooden dolls, plush dolls, and dolls that embody Pinocchio, Alice of the Wonderland, the Nutcracker, Peter Pan and many more. 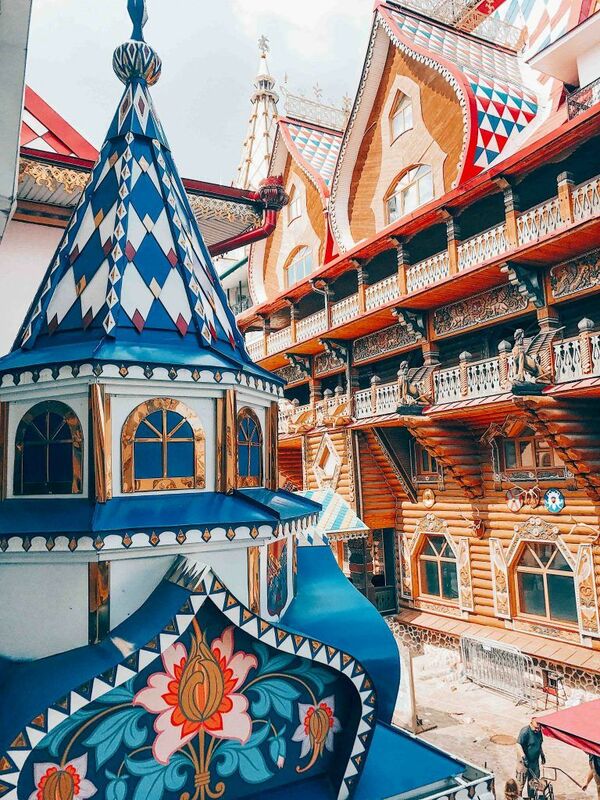 Other museums are the “Museum of Russian Dresses and Life”, the “Museum of fairy tales of Russian fairies” or the “Museum of miniature figures in plasticine” among others. 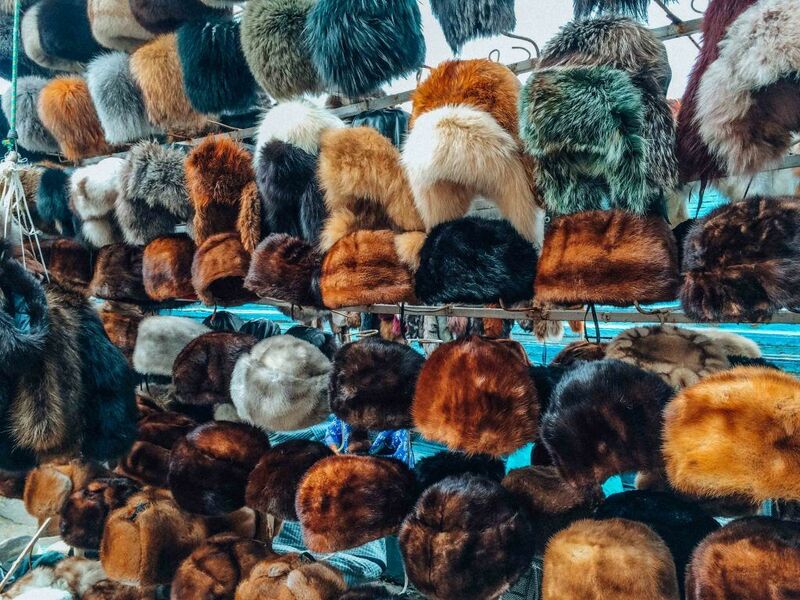 Izmailovo is also famous for hosting one of the most famous markets in Moscow where you can buy the famous Russian souvenirs, carpets, antiques, communist posters and the famous Matrioshkas etc … Do not forget to haggle. 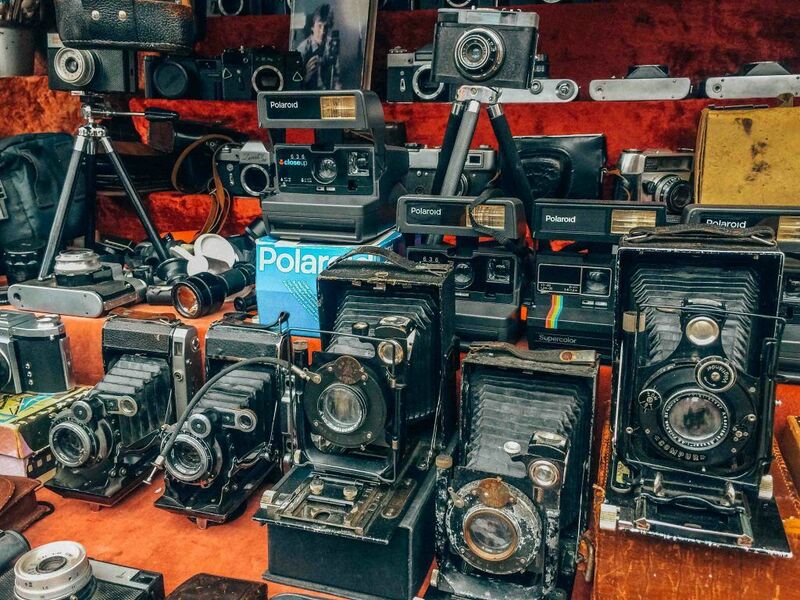 The truth is that you can get some real good antiques for not so much price. 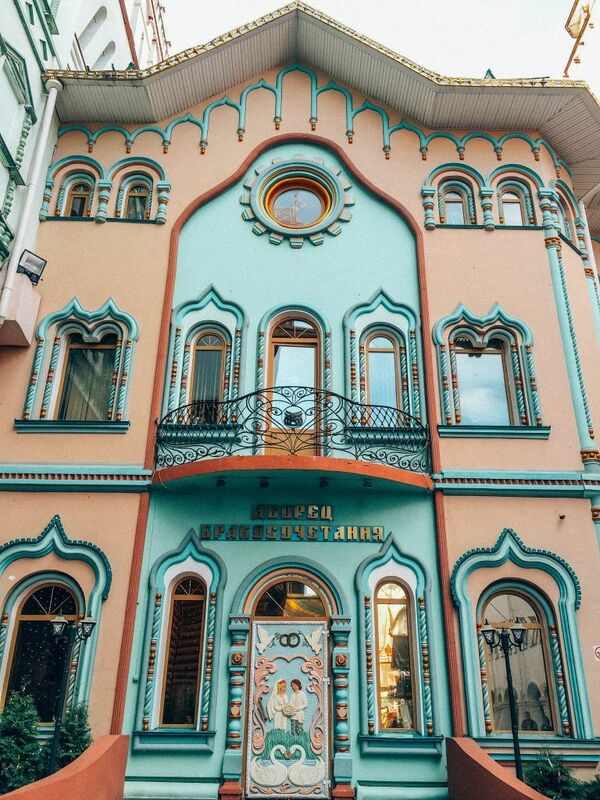 This is one of the places where Russian couples get married and here they find the perfect place to make a banquet and take beautiful photos because the buildings are so colorful here with pastel colors. Here is also the Palace of the Czar, built according to the original plans of the Tsar Alexei. It is a palace of the seventeenth century that currently houses a large restaurant of traditional Russian cuisine called the Dining Room of the Palace of Russia. 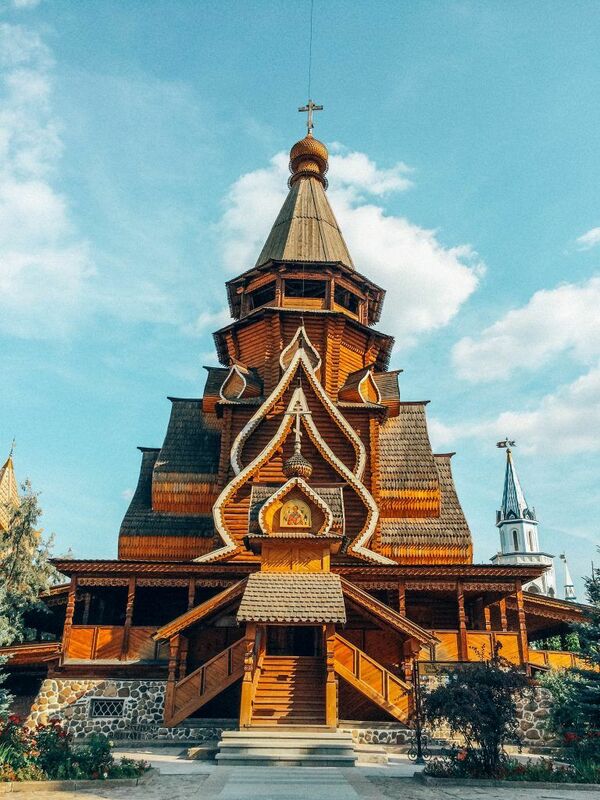 Also located here is the Cathedral of St. Nicholas, it is the largest wooden temple in Moscow. The Izmailovo Kremlin is located on the shore of the Serebryano-Vinogradny pond. An incredible place to walk and forget for a moment that you really find yourself in a city of 17 million inhabitants. Entry to the Kremlin is free, you will only pay for admission to the museums. The opening times are from 10:00 to 20:00. If you come to the market it is better to come on the weekends since you can find many more things to buy. 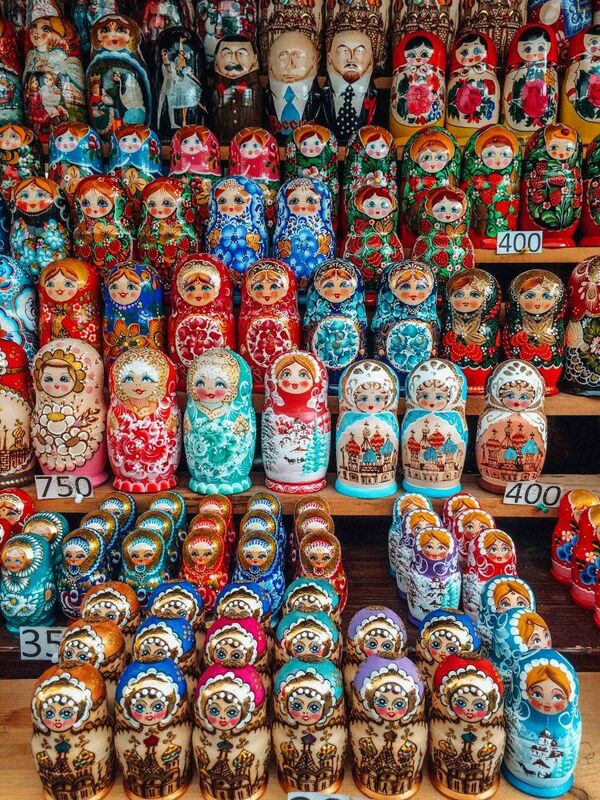 They are dolls, usually of painted or lacquered wood, which are hollow and inside them there is another doll or “matrioshka” smaller and so on. The matrioshkas are not an original Russian craft. It is believed that they were inspired by similar dolls brought from Japan, called Kokeshi. Even the origin is not Russian, the concept of saving objects within other equals already existed in Russia. The first Faberge egg created in 1885 had included inside, a yolk, made of gold and inside this, a hen and a crown. However, there are others who say that Chinese boxes could be the true origin. What is certain is that the word Matrioshka comes from the Latin “mater” concept. The Matrioska symbolically represents the mother figure as well as the fertility and strength of the woman. Regarding the number is also important. They can go from 5 to the desired number but always the number has to be odd. The biggest one that is known has 75 dolls inside! You can find more information here. Opening times: It is always open but if you are interested only in the Izmailovo Market it is better to go during the weekends. For visiting the Museums you can check the Opening times here. How to arrive: by metro, the dark blue line. The Izmaylovo station. From there, you must walk about 5 minutes until you see the Kremlin. If you get off at the next stop, Izmaylovskaya, you will walk around the Serebryano-Vinogradny pond. The way is more beautiful although the most beautiful entrance is the other one and from here it takes 10 more minutes to arrive. Price: Free Entrance You will only pay the entrance to the Museums. The Novodevichy convent is the oldest and probably the most beautiful cloister in Moscow. The architectural complex is a cultural heritage protected by UNESCO. Legend says that Basil III, the great prince of Moscow, built the monastery in the XVI century to commemorate the victory over the Lithuanians and the reconquest of the city of Smolensk. In the sixteenth and eighteenth centuries, the convent of nuns was the convent chosen by the women of the tsarist dynasty, as well as by the wealthy families of boyars and nobles to wear the veil. 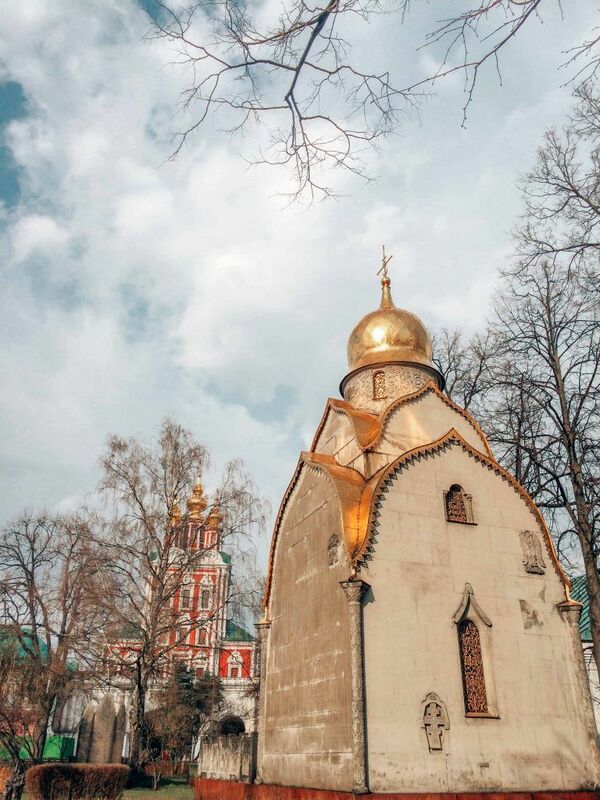 The Novodevichy convent had close ties to the Kremlin and is closely related to the political, cultural and religious history of Russia, with important historical events and important historical figures of the Russian state. 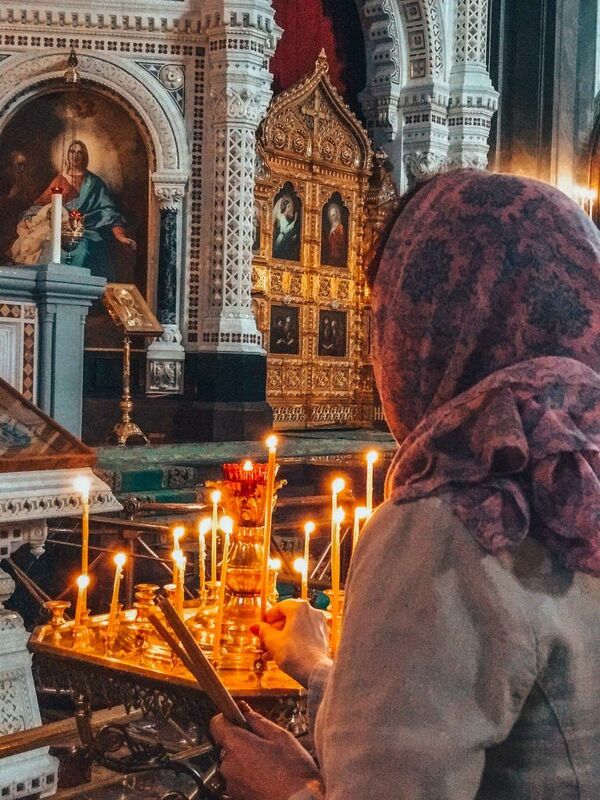 The Novodevichy convent welcomed many members of the royalty who were widows, who had no children or who never got to marry, like the wives and sisters of the Tsars. Not all women came here at their will. 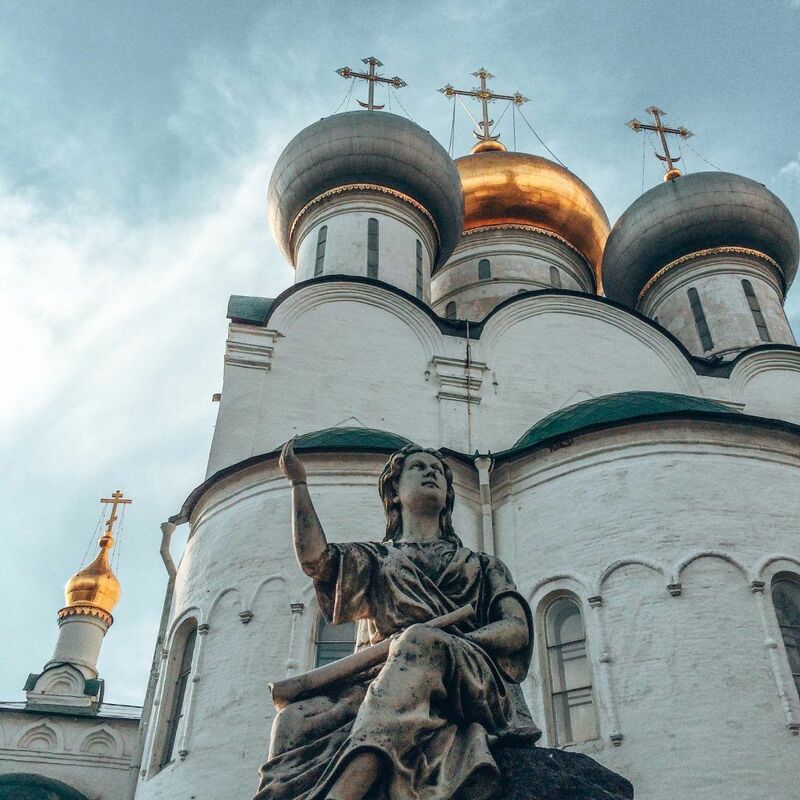 The sister of Peter the First the Great, was confined in the convent since the legend said that she wanted to take away the throne and even her first wife was also here. Within the complex are the Church of the Transfiguration, the Cathedral of Our Lady of Smolensk, the sixteenth century, much like the Cathedral of the Assumption of the Kremlin. 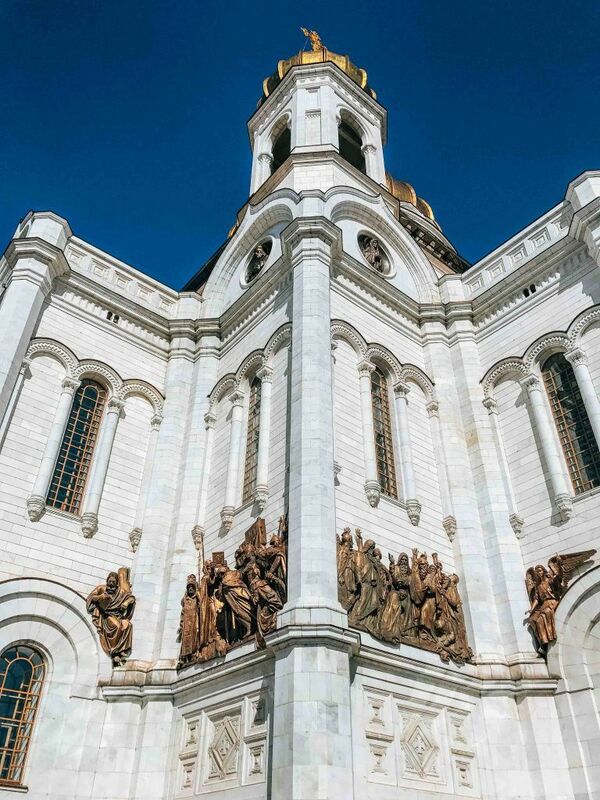 We also see the Church of the Assumption, built in the Baroque style of the Muscovite (17th century), it is the largest building in the complex and externally it looks more like a palace than a church. 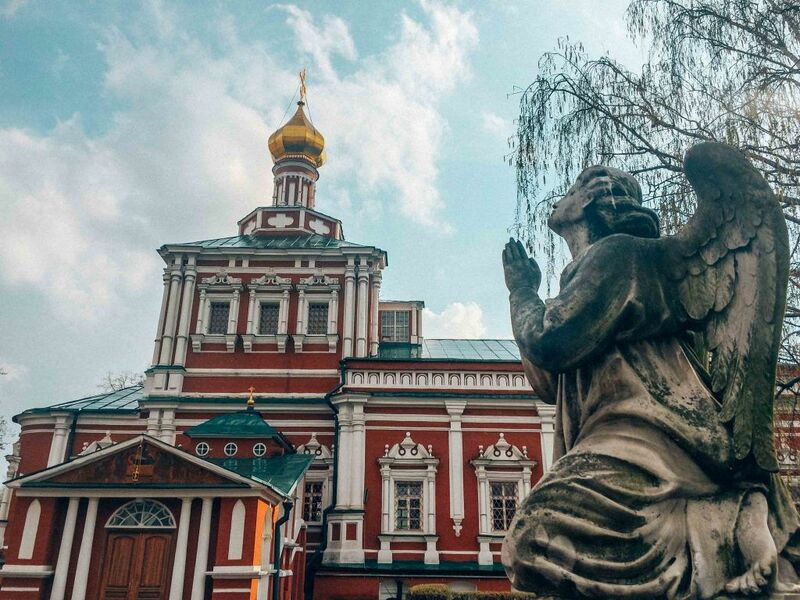 This convent is one of the most beloved also among Muscovites and it was a shame when the bell tower burned down in April 2015. In front of the Monastery there is a large lake in which the legend tells that Tchaikovsky was inspired to compose the “Swan Lake”. In 2004, this Monastery was declared a World Heritage Site by UNESCO. How to arrive: Sportivnaya Metro Station and then need to walk around 5 minutes. Price: 350 rubbles and 100 more if you want to take photos. The cemetery is right next to the Monastery and all the tombs are a true work of art, if the one who had died was a painter, there were brushes and a palette sculpted in the tomb, if he was a musician, he was represented with the instrument he played, etc…. 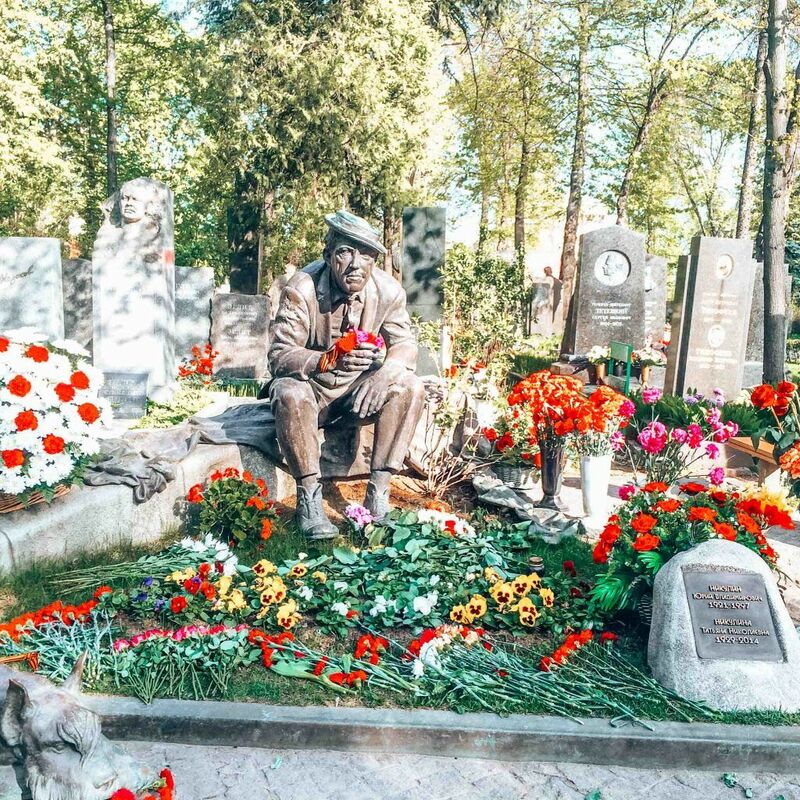 In it you can see Russian personalities buried there like Boris Yeltsin, Yuri Nikulin, or Raisa Gorbachev as well as several poets, scientists and politicians, among them Khrushchev, the only Soviet leader who is not buried next to Lenin’s mausoleum in Red Square. Members of the Tsar’s family and his entourage were also buried in his cemetery. As a recommendation, tell them that if you do not read Cyrillic it will be difficult to locate the graves in the cemetery. If you can, ask a worker there to show you what you want to see in exchange for a small tip. 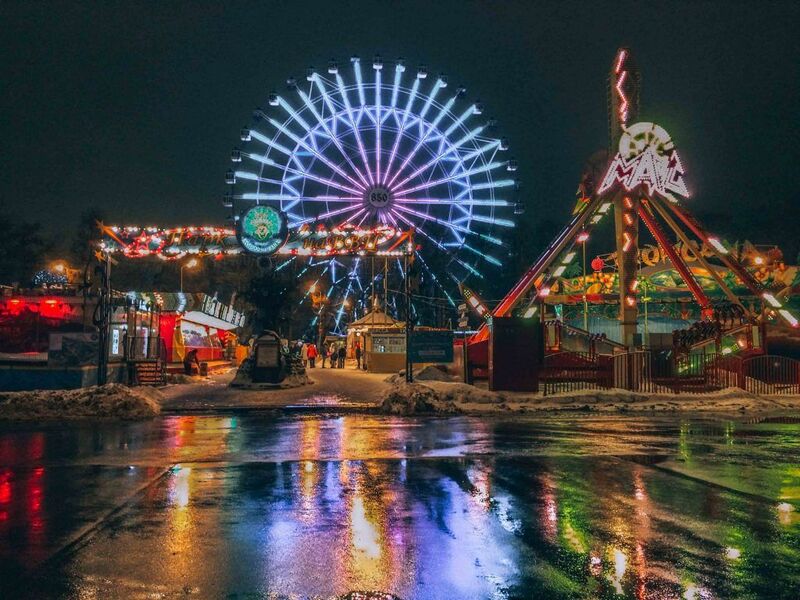 It was created in 1939 by order of Stalin and was a large park at first intended for agricultural exhibition, but 20 years later it was transformed into an extensive park to the glory of the economic, scientific and technological achievements of the country. That is why, today, you can see there aircraft and space rockets. After the disintegration of the Soviet Union in 1991, some private companies resumed the different pavilions. 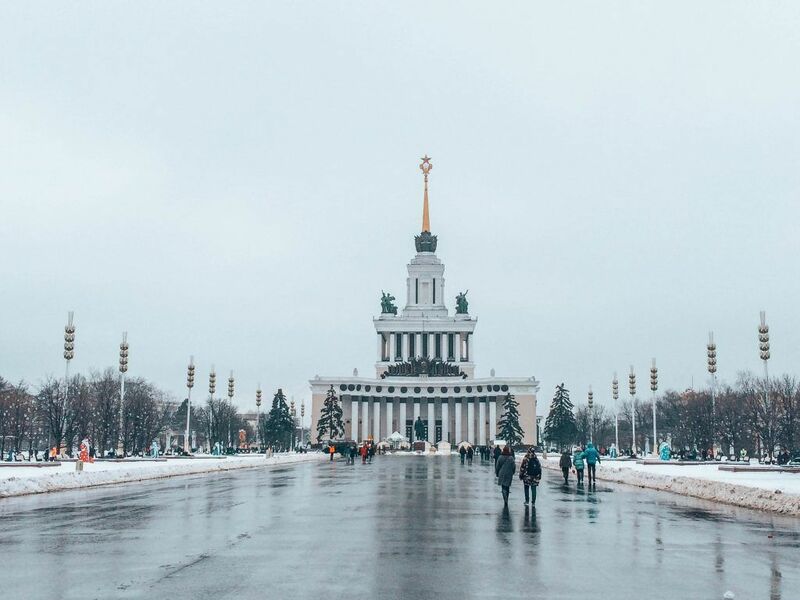 If you want to visit the most Soviet Moscow you can not miss this venue. It is giant like all the typical things of communism counting on 200 hectares. The best way to get there is by metro. The station is called VDNKh because they are the acronym in Russian with which the park is known. 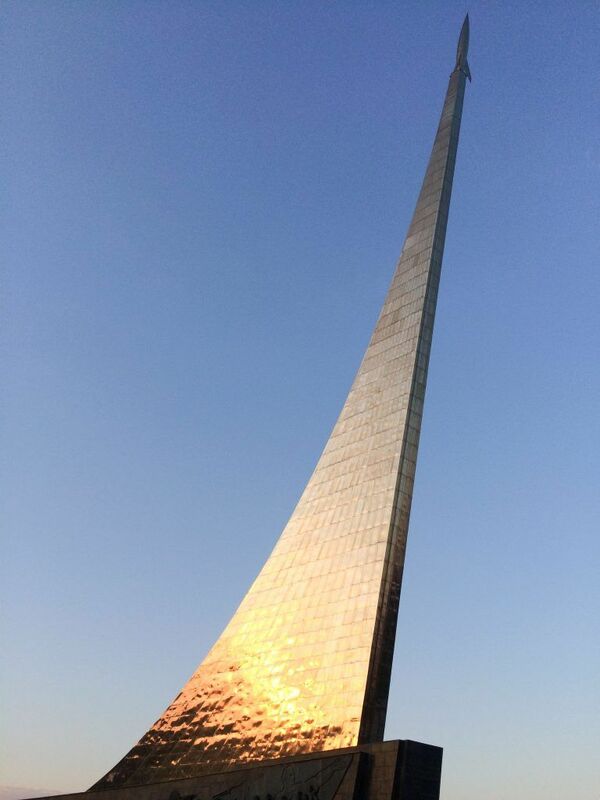 Once you leave the metro, what you will see is the Monument to the Conquerors of Space that simulates the wake of a rocket in its takeoff. Below we can visit here the Museum of Cosmonautics where we can see an interesting exhibition of satellites, astronaut costumes, and we can even see the dog Laika, the first living being that stepped on the space. But if we keep walking we arrive at the entrance of the hall, of the Panruso exhibition center. The entrance to the compound is marked by a huge door crowned with a statue of a two workers -a man and a woman- one holding a sickle and the other, holding a hammer . It was created for the Soviet pavilion for the EXPO in Paris in 1937. Then we will see the main pavilion, an impressive white building with monumental columns and porticos. 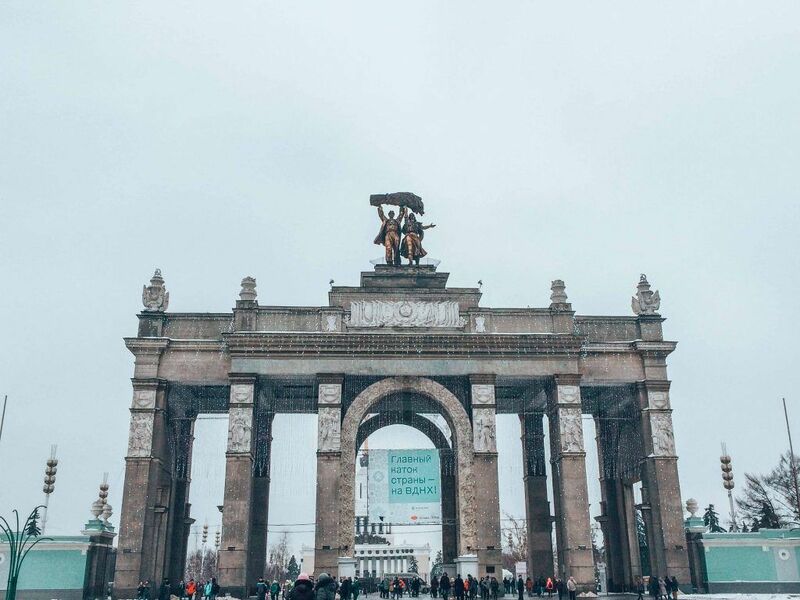 On the facade we can see the coat of arms of the Soviet Union and the old republics that were formerly part of the USSR and in front of a statue of Lenin. 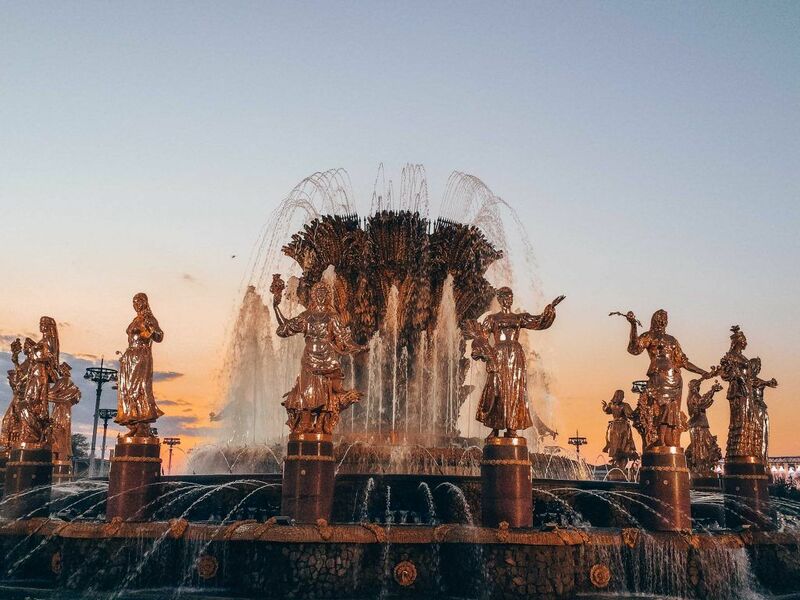 We continue walking and we find countless pavilions such as the Republic of Armenia, Belarus, Azerbaijan or Kazakhstan and in the middle, the famous fountain Friendship of the Peoples, formed by fifteen golden statues representing the former republics that formed the USSR. Today there are exhibitions in the different pavilions and there are different cafes and restaurants. It is a great plan to spend the day. The winter they ride a giant ice skating rink being considered as the biggest in Europe. 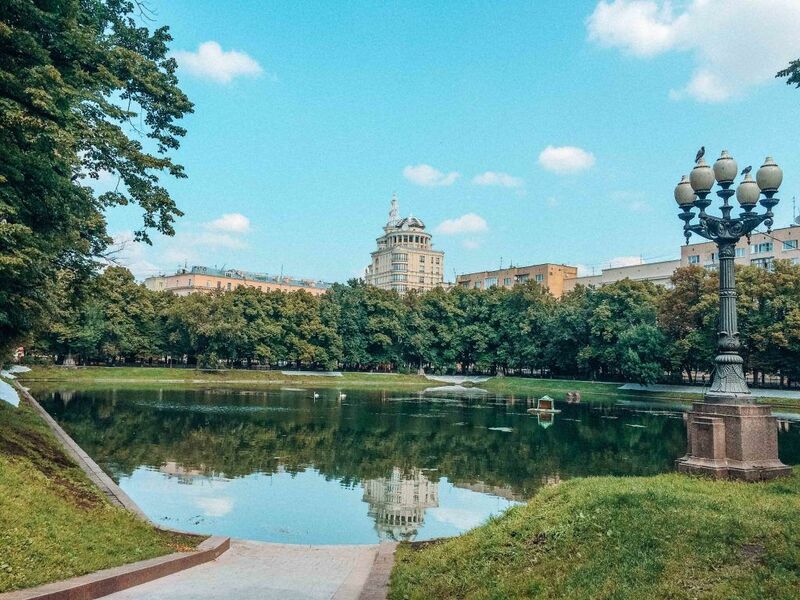 In summer it is ideal to rent a skates or a bicycle and walk around the park and even get to the Ostankino park summer and go to the lake area where there are several restaurants with terraces perfect for lunch or to rest and have a drink. They also do outdoor concerts, marathons, etc … It is a very lively place. There is also the Moscow Aquarium that I will talk about in a future post. It also has a mini amusement park. There are two in Moscow but it seems to me to be cozy and pretty the one next to the Metro stop: Prospect Mira (yellow and brown metro line). 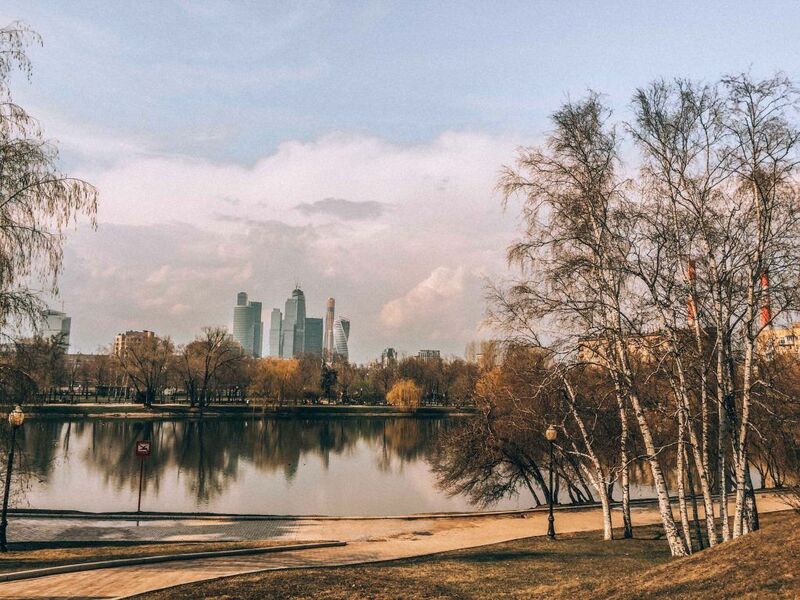 Together with other parks in Moscow, this is a small oasis of peace amid the busy rhythm of the city. Founded by Pedro I in 1706 as an apothecary where the students of the Faculty of Medicine could grow and study the medicinal plants. It still belongs to the Moscow State University. Legend has it that Peter the Great himself planted three coniferous trees here, one of which, the larch, still exists. Here future doctors were trained. In the nineteenth century, the Apothecary became the center of national botany: it works for famous scientists, and the collection of plants is not inferior to the famous collections of botanical gardens in Europe. 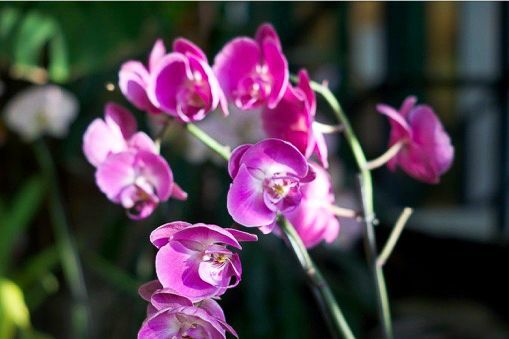 There are several greenhouses but one stands out where there are tropical plants and there are several carnivorous plants. 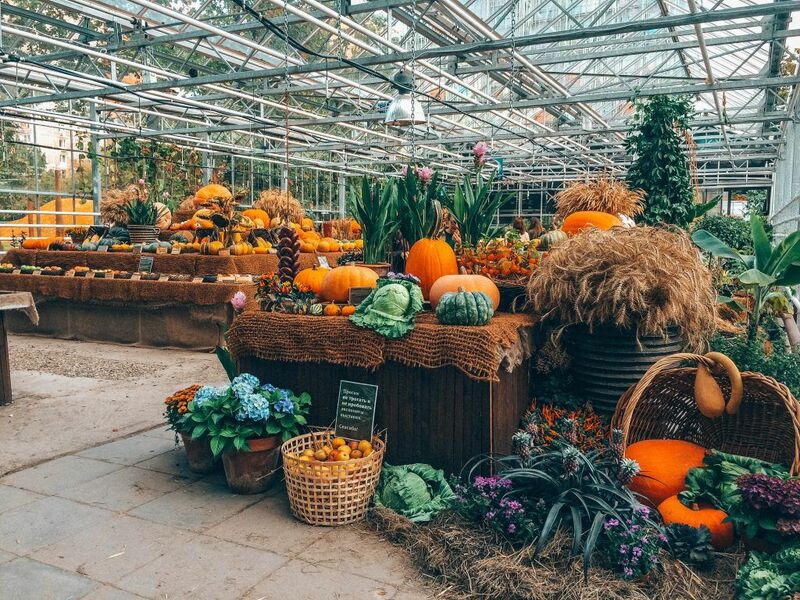 In another greenhouse tend to have “exhibitions” Personally I love the autumn where they put seasonal fruits and pumpkins. 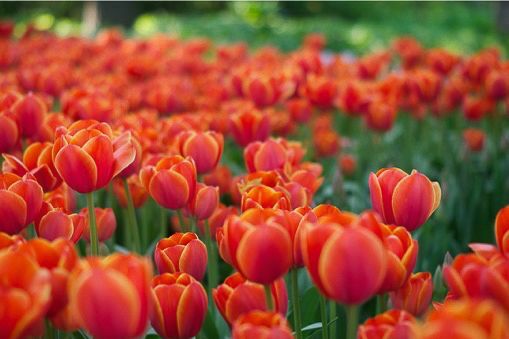 It is super nice both in winter, spring and as in autumn or winter. Each station is reflected here perfectly. In addition, it has its own flower shop where you can buy several pots and plants to decorate the house. Also, in the surroundings, there are several cafes and restaurants. My favorites are the Upside Down Cake, where you will find the best cakes and cupcakes in Moscow. Do not forget to try the Lemongrass Coffee . To eat, I recommend you the Georgian restaurant called Kachapuri, a great discovery in Moscow. The Georgian food is delicious. 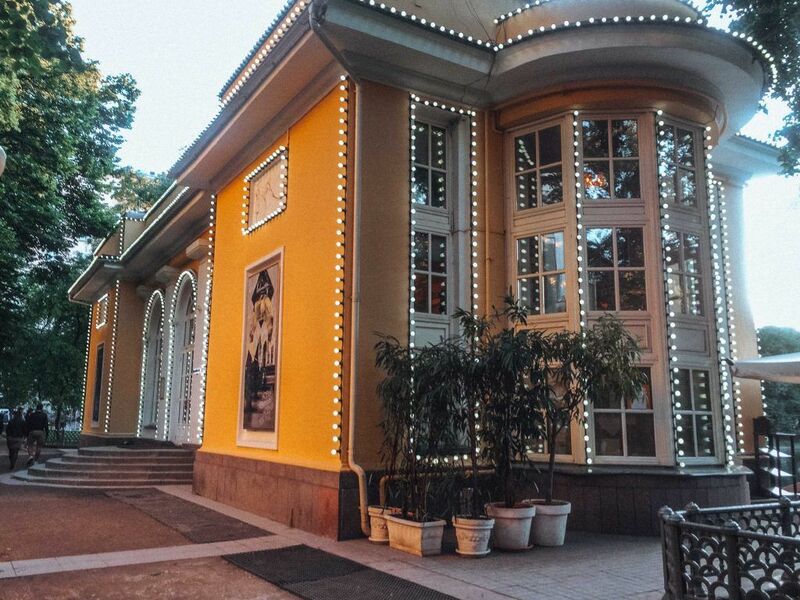 Also, in summer, they have a lovely wooden terrace on the first floor with views of the Botanical Garden and on weekends they have live piano music. Opening Times: 10.00-20.00 h. Price: 300 rublos. 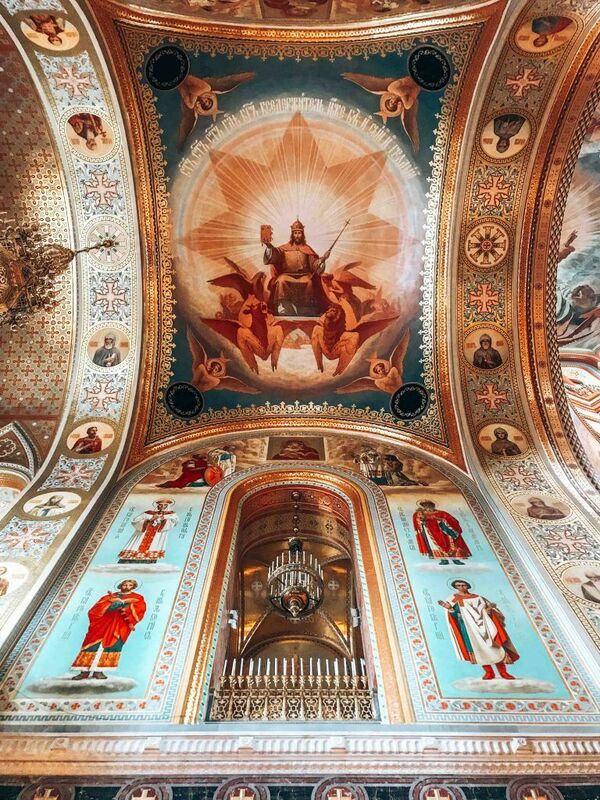 It is one of the most beautiful Orthodox cathedrals in Moscow and the most beloved by Muscovites. It is really a recent construction since the previous one was demolished by Stalin (of course !!) who wanted to build the Palace of the Soviets there, which would be the largest construction in the world. Thank God, this project was never carried out due to economic problems, the floods caused by the Moskva River and the outbreak of World War II. In the sixties a large public swimming pool was built in that same place. Later, in the 90s, the Cathedral was rebuilt until it opened to the public again in 2000. 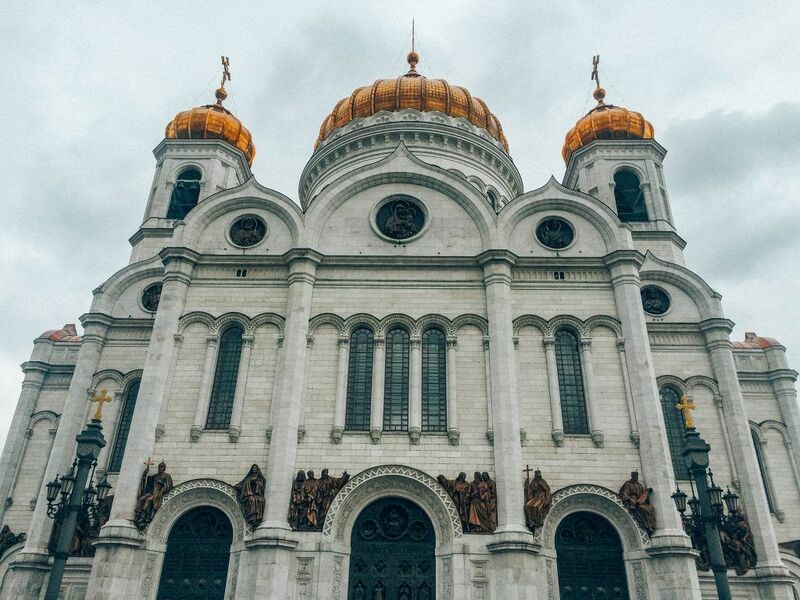 The Cathedral is very beautiful inside but above all, it seems to me personally, with its majestic golden domes rising towards the Moscow sky. Inside is built with several types of stone and several imported marbles. 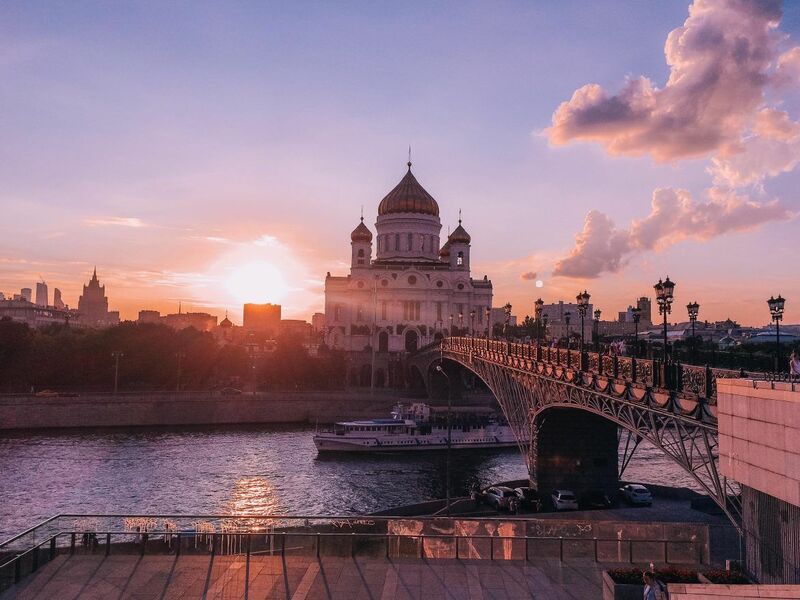 One of the sides of the Cathedral overlooks the Moskva River where there are incredible views of the Kremlin. 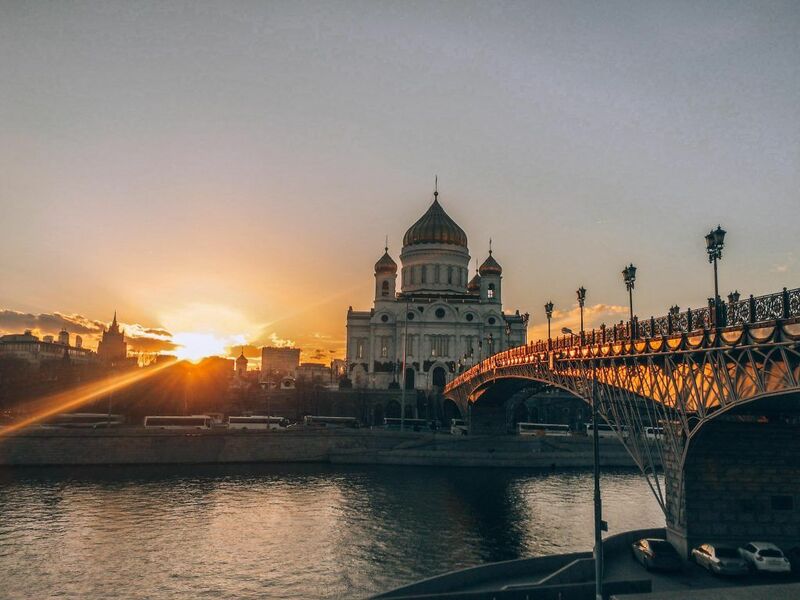 If you cross the pedestrian bridge, just on the other side, the views of the bridge with the Cathedral in the background are some of the best in Moscow. 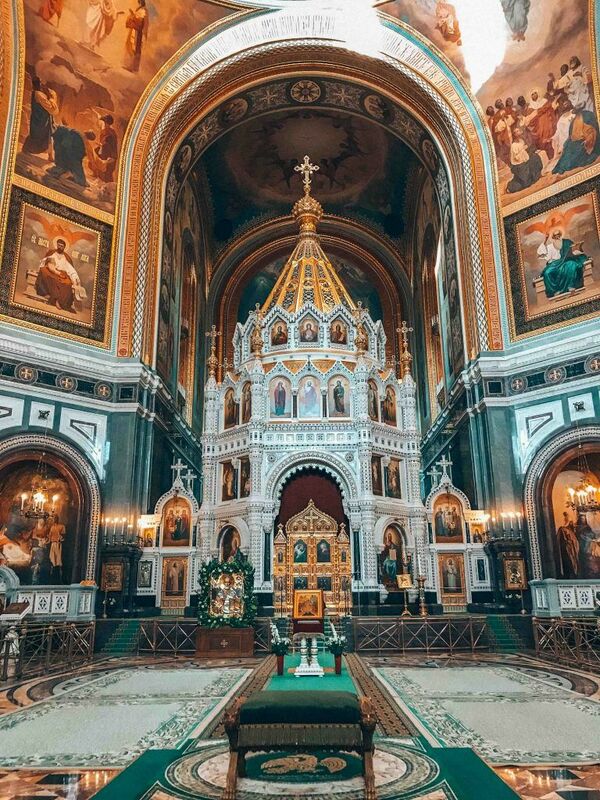 In the year 2000, the canonization of Tsar Nicholas II and his family, took place in this cathedral. On April 25, 2007, the funeral of Boris Yeltsin was celebrated there, this was the first state funeral with participation of the Russian Orthodox Church. Opening Times: 8:0o h a 20:00 h .
How to arrive: Red Line. Metro Station: Kropotkinskaya. In the seventeenth century, this place was erected for the residence of Patriarch Herman, and a residential patriarchal district was created. A little later, three ponds were built to farm different fish species. This fishes served to supply the Patriarch´ family, that’s why they adopted the name of Patriarch’s Ponds. After a while, all the ponds except for one, were closed. Around the last pond a plaza was built and became part of a beautiful garden next to the buildings of the old residences. 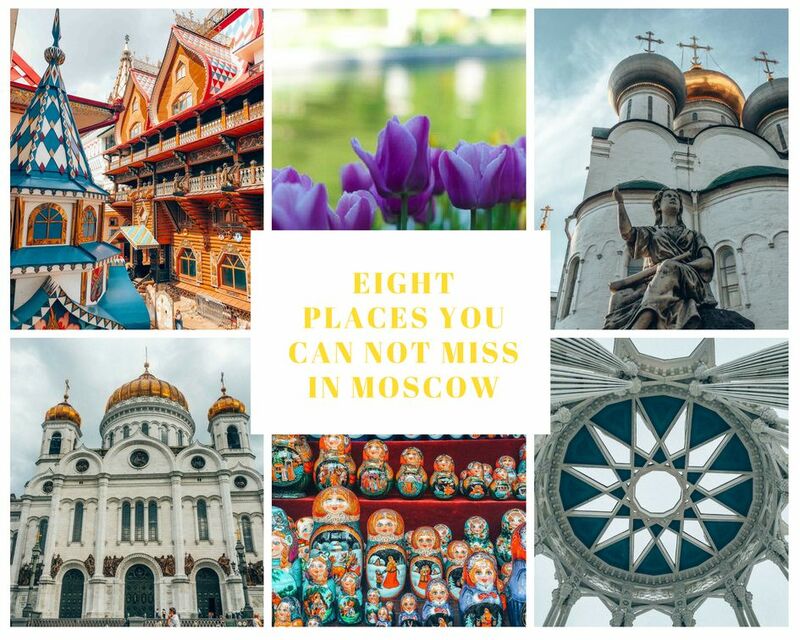 Great poets and writers such as Dmitriev, Pushkin or Gogol have resided, at different times, in this central district of Moscow, which is considered an elite place in the capital. It is one of the most prestigious neighborhoods and one of the most appreciated by all the inhabitants of Moscow. 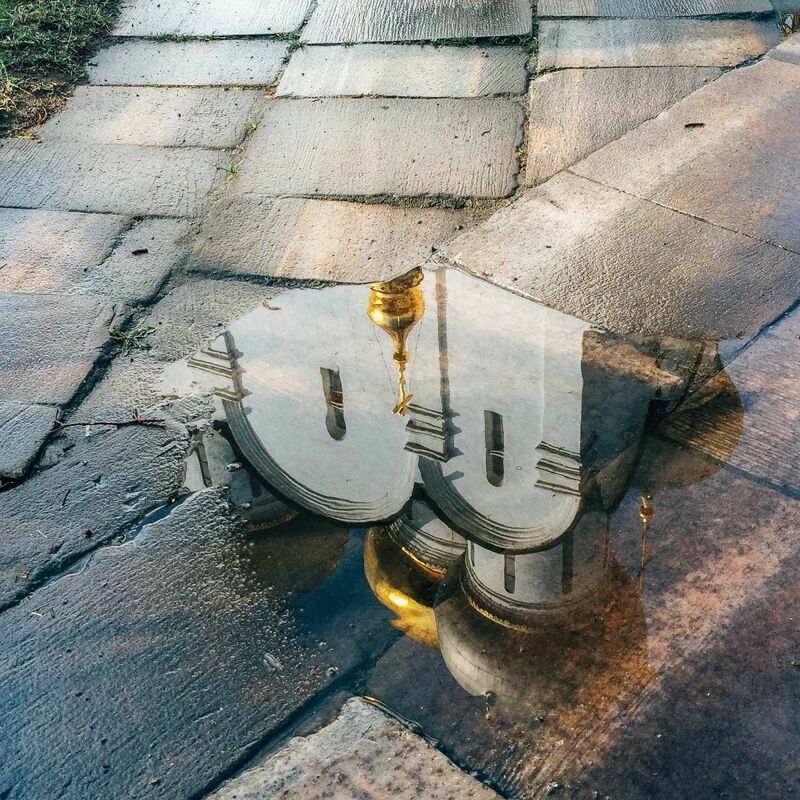 The famous novel by Mikhail Bulgákov, “The Master and Margarita” begins mentioning the Patriarch’s Ponds: “once in the spring, at the time of the unbelievably hot decline, in Moscow, over the ponds of the Patriarch, two citizens appeared …”. “The Master and Margarita” relates the visit of the devil to the impetuous and skeptical Soviet Union. It is one of the great literary works of the twentieth century and one of the most important Soviet satires. With this literary work the ponds of the Patriarch were made known to the whole world and little by little they achieved the undoubted fame they have today. 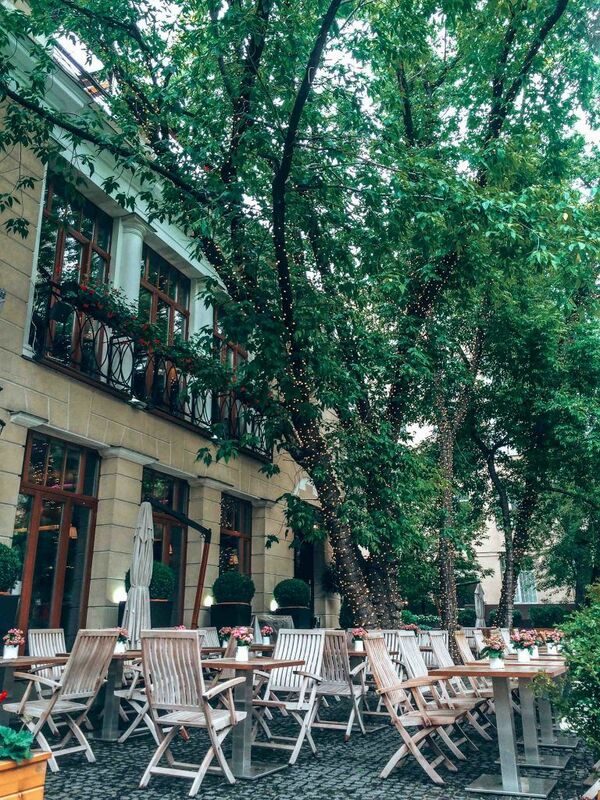 The truth is that this place, in the center of Moscow, is a great escape from the bustle of nearby Tverskaya Street and the Ring of Gardens, and an incomparable place to watch people rest. In winter, the pond serves as an ice rink and, in summer, hosts several swans. 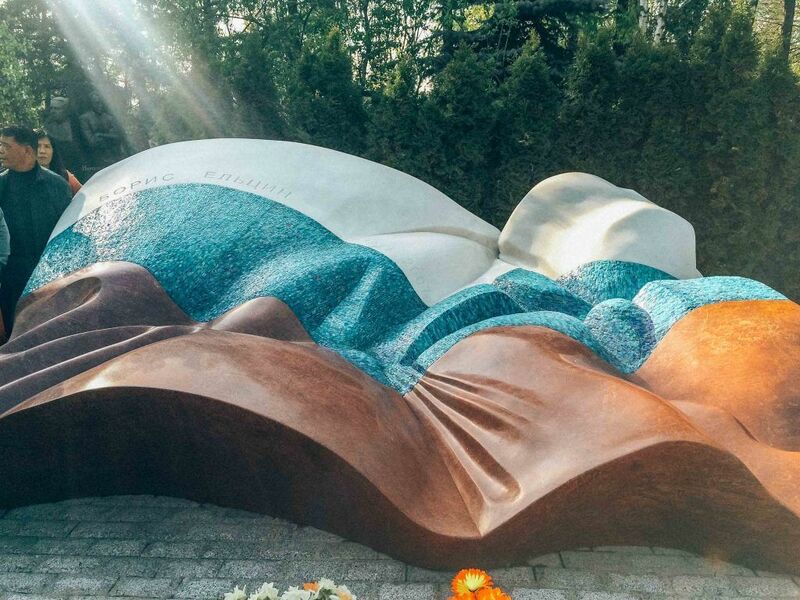 Children appreciate the playground, surrounded by bronze screens that represent the fables of another favorite Russian author, Ivan Krylov. 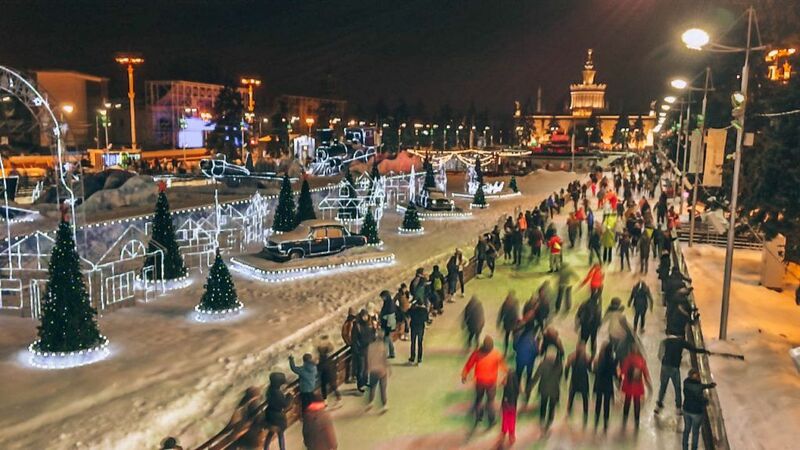 This is the place to see and be seen in Moscow. 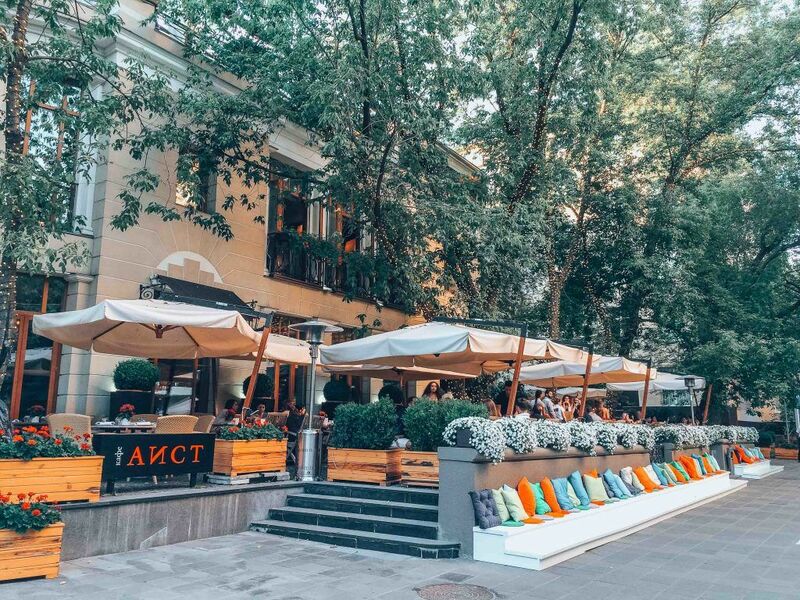 The Russians put on their best clothes and go for a walk around this neighborhood while they enjoy some cocktails with their perfect manicures on one of the coolest terraces in Moscow. And the Russians love to take care of themselves, and you will realize this, when you see the amount of beauty salons that are in each block opening 7 days a week .. Here are the coolest cafes and restaurants in the capital. 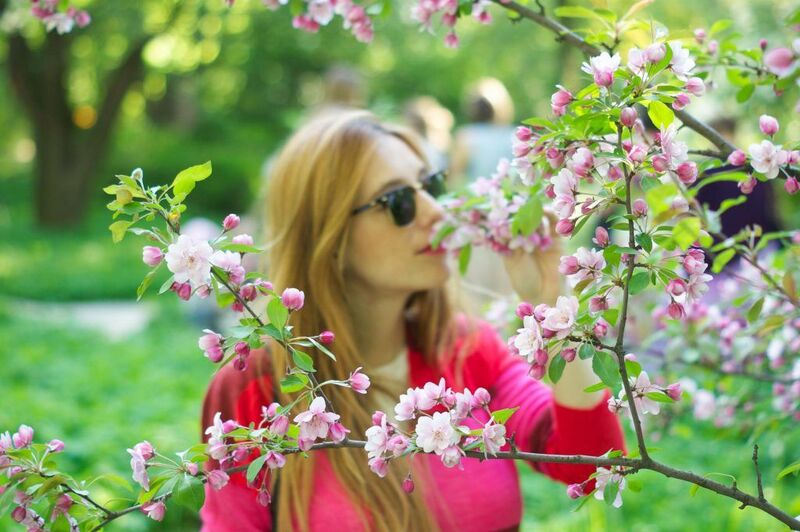 It is one of the neighborhoods with the most purchasing power in Moscow. With good weather, the wealthy Muscovites put away their big winter cars and take out their Porsches, Ferrary, Lamborgini, Rolls Royce, Mercedes Maybach – a luxury car from the house Mercedes – etc so it is not surprising that you see all these cars walking around here on a spring or summer day. 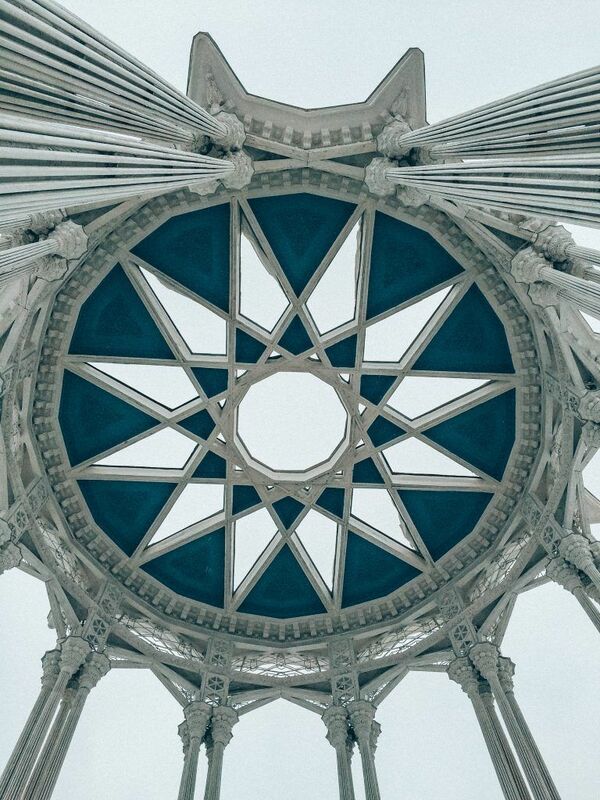 Here is also the Moscow Synagogue and I recommend you to go to the restaurant located on the rooftop of the Sinagogue. It is called Jerusalem, they have of course Kosher food (Jewish) and the food is amazing. Of course, you will have to book in advance,here and in all the restaurants in the area so you can find a place. It has a great terrace in spring-summer. 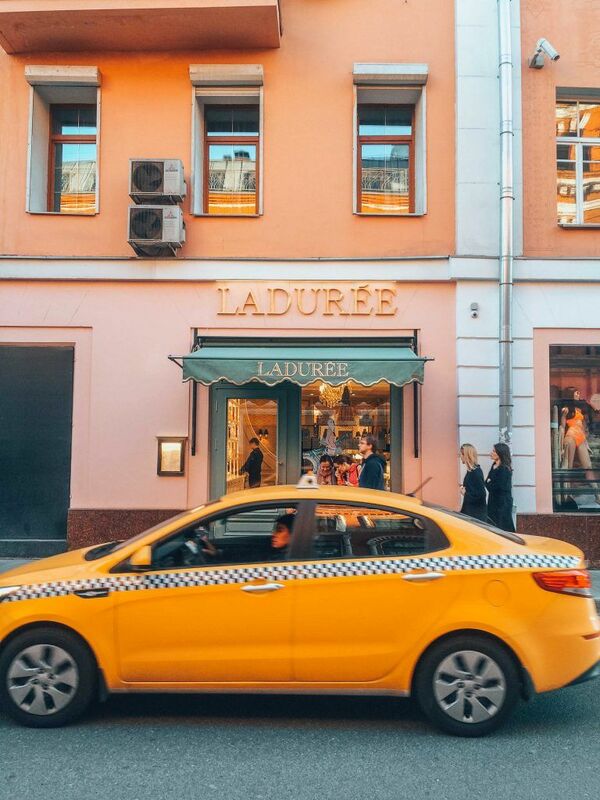 In this neighborhood you will find Laduree, with the best macaroons ever, Christian Louboutin, Giuseppe Zanotti, Chanel or Agent Provocateur. How to arrive: Metro Station: Tverskaya, Barrikadnaya, Pushkinskaya and then, you should walk like 10-15 minutes. Kolomenskoe is one of the most beautiful places in all of Moscow. The town of Kolomenskoe was founded in 1237 by refugees from Kolomna. Subsequently, the village first became the property of the Grand Prince and then the Tsar’s. Peter the Great was brought here for his own safety during the bloody insurrection of 1682. 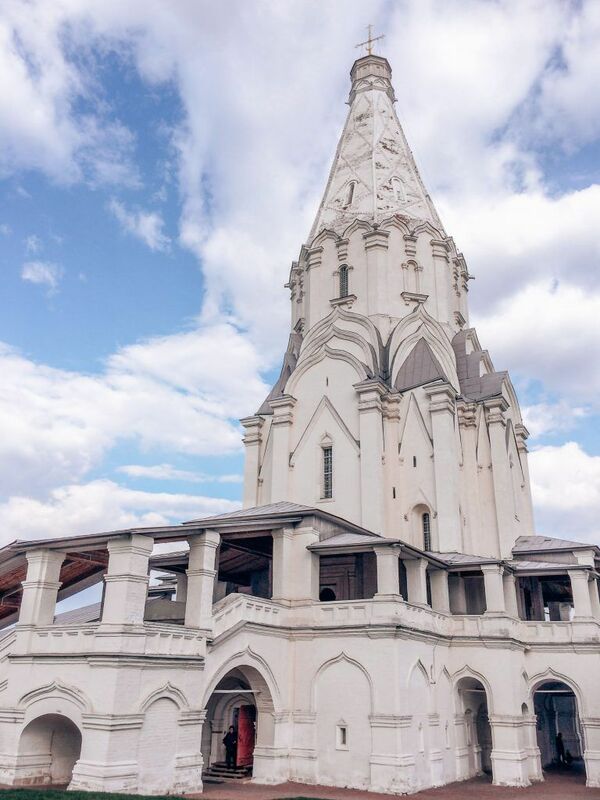 A museum was founded here that became the Museum of Wooden Architecture although the main attraction of the park is undoubtedly the Stone Church of the Ascension of the Lord. It was built in the sixteenth century by order of Tsar Vasily III to commemorate the birth of his son and heir, Ivan the Terrible. 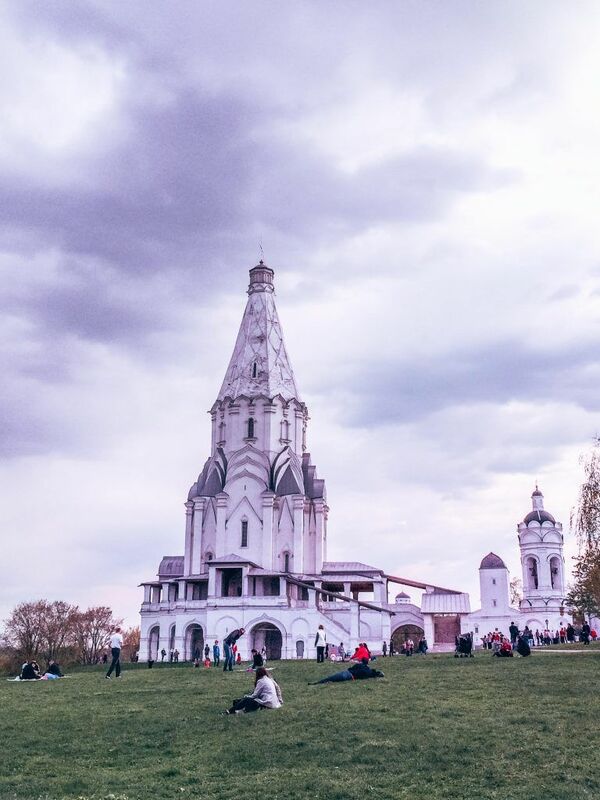 But there is much more to see in the park, with other places of interest such as the beautiful Church of the Icon of Our Lady of Kazan, with its bright blue domes and abundant gold. 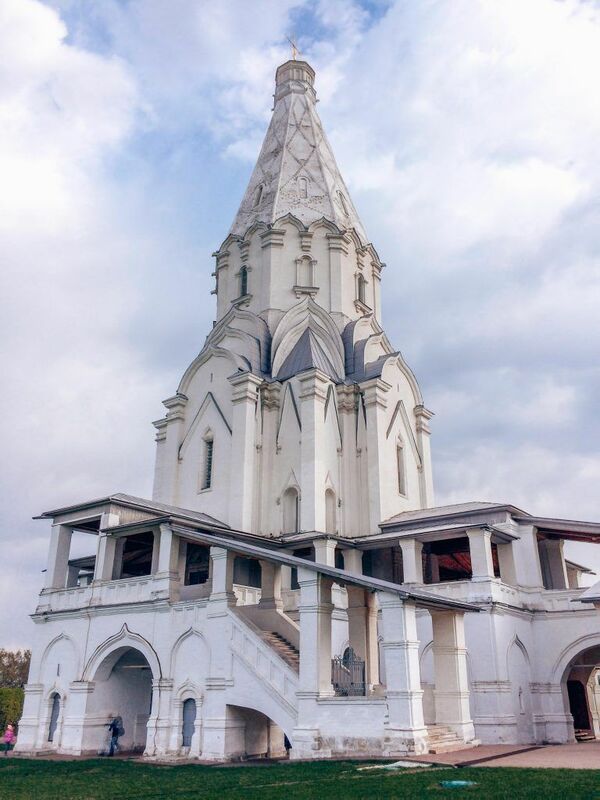 Further inside the park, there is the Church of the Decapitation of San Juan Bautista, built by Ivan the Terrible to commemorate his coronation. 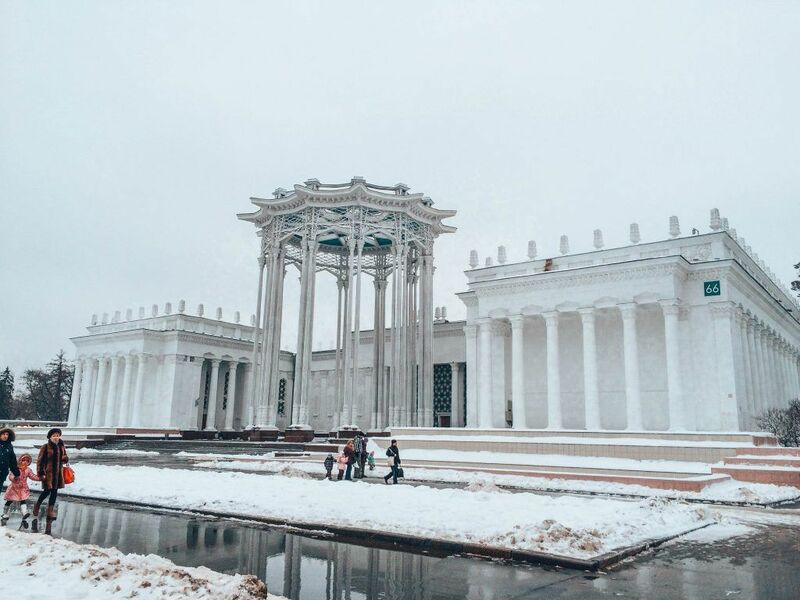 The secret jewel of the Kolomenskoye park is the Summer Palace of Tsar Alexey Mihailovich, declared a World Heritage Site by UNESCO. The palace was built in the seventeenth century without using only a nail and is only made of wood. 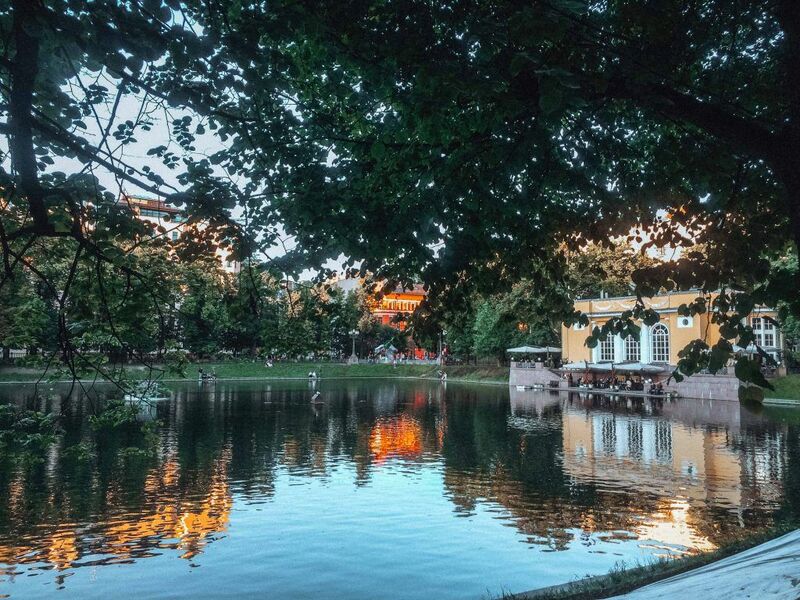 In summer, Kolomenskoe is one of the most popular places for Muscovites to come to spend the day. 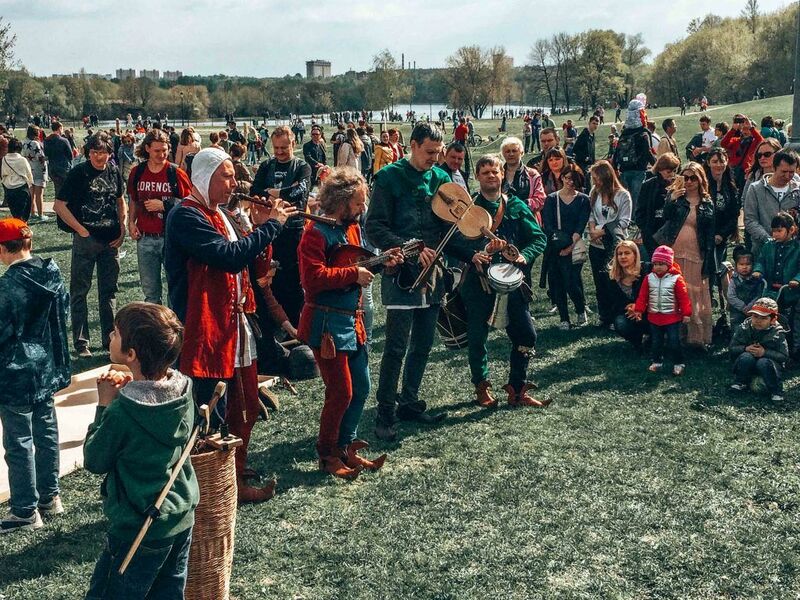 In addition, a Medieval Justas Tournament is held once a year. In winter, the park is perhaps even more impressive, when there are many fewer visitors and it is all surrounded by snow. 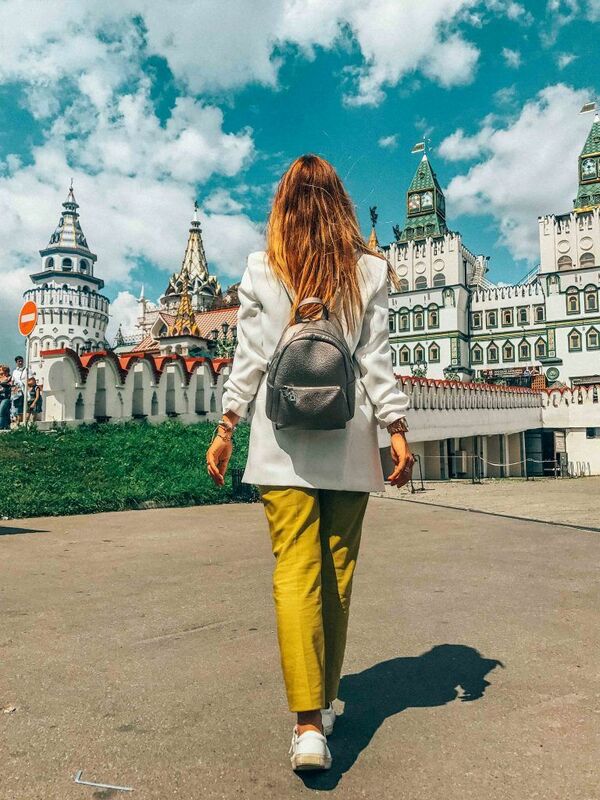 At any time of the year when you go to Moscow, Kolomenskoe should definitely be on your itinerary. How to arrive: even it seems a little far from downtown it will only takes around 20 minutes to arrive here.Metro Station: Kolomonskaya in the green line. Then, you should walk around 10 minutes. Here you can find more posts about Moscow.